Evaluate current and probable tuition charges for Bridgewater State, and just how these prices contrast to the U.S. average. See how the tuition and fees at Bridgewater State compare to the average and find out how to properly plan for possible college tuition growth. For nationwide, regional and statewide comparisons, look at the table below to find out how Bridgewater State compares to other colleges. Tuition and fees at Bridgewater State is lowered significantly for residents of Massachusetts. Tuition and fees for in-state students is set at $10,012 for the 2017 - 2018 year, a 38.0% discount off the price charged to out-of-state students. Tuition is $910 and fees $9,102. Out-of-state students at Bridgewater State spent $16,152 in fees and tuition in 2017 - 2018. Of this total, $7,050 was the price of tuition and $9,102 the expense of fees. How much does Bridgewater State cost part time? Discover Bridgewater State cost per credit hour here. Bridgewater State University tuition and fees for out-of-state students increased at an average yearly rate of 2.6% in the last five years. Over that same period, tuition increased by 0.0% and fees increased by 4.7%. Due to this, we predict the price of tuition and fees this year will be $16,572. At this rate, we estimate the total cost of tuition and fees for a two year degree to be $33,575 and for a four year degree to be $68,918. This doesn't cover other charges including room and board, books, and transportation. 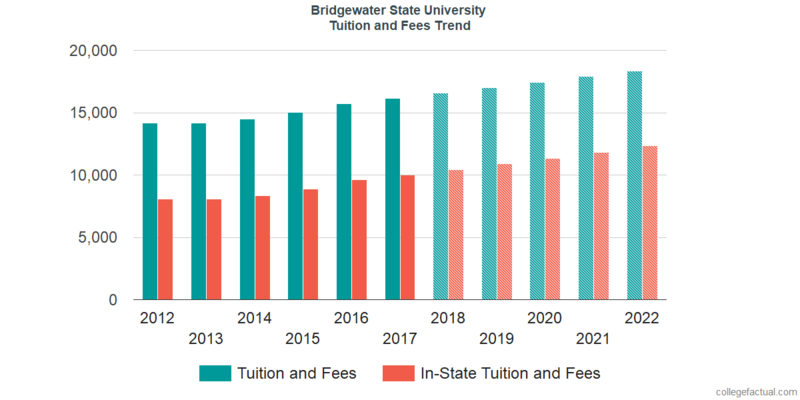 Take a look at this next chart to find out how Bridgewater State fees and tuition might develop including residency based reductions in the years to come. Take note of just how much the tuition and fees are increasing each year. At a lot of colleges students will wind up spending more money on their last year of school than they did for their first. Discover our answers to frequently asked questions and more information about college tuition and fees.